My Pitts S-1C is a single-place biplane. She is named Fifinella, after the Disney character that symbolized the Women's Airforce Service Pilots (WASP) in World War II. Fifinella is equipped with inverted fuel and oil systems, and is capable of intermediate-level competition aerobatic maneuvers, including loops, rolls, hammerheads, Immelmans, Cuban 8's, and many other more advanced maneuvers. Fifinella was built 17 years ago by an individual in Wisconsin. 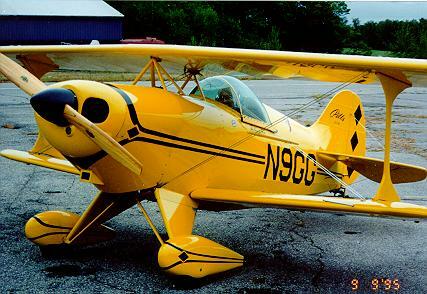 She has a 160 hp Lycoming O-320 4-cylinder engine, and weighs 679 pounds empty. Her cruise speed is about 135 mph, and rate of climb is well over 2000 feet per minute. Fifinella's extremely high power to weigh ratio give her awesome acceleration and fantastic climb, making her a real thrill to fly. She has very well harmonized controls, but with only two ailerons, her roll rate is a bit poky. Her short length, high landing speed, rapid tailwheel gearing, and nonexistent visibility over the nose make every landing an incipient emergency. All in all, though, Fifinella is immensely satisfying to fly. 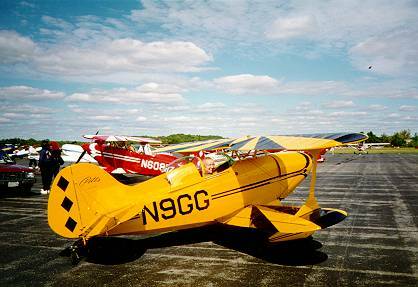 Sadly, I was forced to sell Fifinella in November, 1996, after having flown her for only 13 hours in the fall of 1995. Check out a gallery of Pitts Photos.